CARANDA BATERII® distributes motor batteries from STORM and WIND range manufactured by the Italian company FIAMM. The STORM range batteries are manufactured with AGM/VRLA technology, are sealed and do not require maintenance. The WIND range batteries are manufactured with conventional technologies. 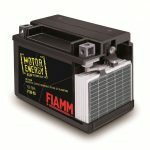 Baterie moto FIAMM 12V 8Ah FTX9-BS AGM. Acumulator moto fara intretinere sigilat. Cod YUASA YTX9-BS. Baterie moto FIAMM 12V 10Ah FTX12-BS AGM. Acumulator sigilat fara intretinere. Cod YUASA YTX12-BS. Baterie moto FIAMM 12V 11Ah FTZ12S-BS AGM. Acumulator sigilat fara intretinere. Cod YUASA YTZz12S-BS.